A time to gather with the family will be held one hour prior to the service at Hope Lutheran Church in Sioux Falls. Barnett-Lewis is handling all of the funeral arrangements. Gustaf's Greenery is the florist in Sioux Falls handling all floral and greenery arrangements. 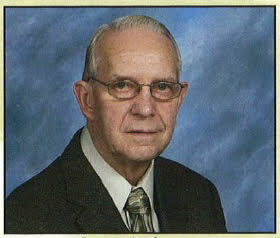 Lester Duane Anderson, the son of Alfred and Emelia (Erickson) Anderson, was born on June 6, 1934, in Davis, SD. He grew up in Canton, SD, where he graduated high school. On April 14, 1956, Lester was united in marriage to Carolyn (Connie) Boelens. Together they made their home in Sioux Falls where they raised their two sons. Lester and Connie celebrated 59 years of marriage last April. Lester worked at John Morrell for 32 years and after Morrell at JDS Industries, both in Sioux Falls. Outside of his employment he enjoyed watching tons of sports on television, and lots of dancing, camping and bowling in his earlier years. Lester is survived by his wife, Connie Anderson of Excelsior, MN child: Todd (Shelley) Anderson of Minnetrista, MN; and three grandchildren: Scott Anderson of Spencer, IA, and Allie and Logan Anderson of Minnetrista, MN; one sister: Delores (Lowell) Warner of Sioux Falls: one brother: Marlin (friend Lois) Anderson of Canton, SD. He was preceded in death by his son Jeff, his brother Eldon Anderson, his sister Ardis Johnson and his parents Alfred and Emelia Anderson.